I have to admit that until fairly recently my skincare routine has been less a routine and more something that I did when I remembered and had the energy. I decided at the beginning of this year to start a proper routine and try to stick to it. I did end up trying a few products to see how well they worked that I used to use but using them more regularly made my skin break out. Now I have certain products I am sticking to (mostly anyway) I thought I’d do this post. The first thing I do is use my Black Magic face wash by One Hand Washes the Other. My skin is acne prone and even with medication I still need a face wash that deals with that. I’ve found that a lot either dry my skin out or aren’t strong enough to keep my skin clear. This has a lot of natural ingredients meant to help the skin, unfortunately there are none of this product still in stock due to the sale and I can’t remember them. I’m pretty sure one was tea tree and there is definitely charcoal which gives it the black, or dark grey, colour. I have it in both the bar soap and cream wash formula. The cream wash is less intense and trying than the bar soap but it does not survive well in a shower or when dropped in a bath which is why I got the bar though it is more drying than the creamy wash. The cream is easy to use, I just use a tiny amount with the spatula that came with it (which I forgot to photograph) and add a bit of water when I rub it between my hands, lather it on my face and splash it with water to wash it off. I do pretty much the same with the bar soap and this has lasted me a long time so far. When I got the Jeju Hallabong Energy serum from The Yeon in my Meme Box I wasn’t sure how much I’d use it, however after rediscovering this I love it. Some days I don’t bother with anything more if I’m staying inside though it has no spf so not days when I need that. It works as a good base and does seem to smooth my skin. I wish it was available in the UK, if I can’t find somewhere that sells it here I’ll be having to find another serum when this runs out as I like this extra layer. I think the citrus in it helps to keep my skin drier than other serums as they can make my skin a bit oily at times. Another product from my Meme box is the Tony Moly Appletox Apple and Honey moisturiser. This impressed me quite a bit when I first used it but its texture put me off a bit as it’s a bit sticky when you’re applying it. I normally use this about ten to fifteen minutes after the serum so it’s dried completely. It smells amazing and keeps my skin smooth, though in the summer I’m using something SPF on days when I don’t have makeup on this is my favourite moisturiser. I sometimes use this and then put the face sun cream on an hour or so later before I go out. I have never been much of a fan of eye products, I don’t know why I didn’t see the point in them, until I got one in a Latest in Beauty box and then I needed to try another that was cheaper. 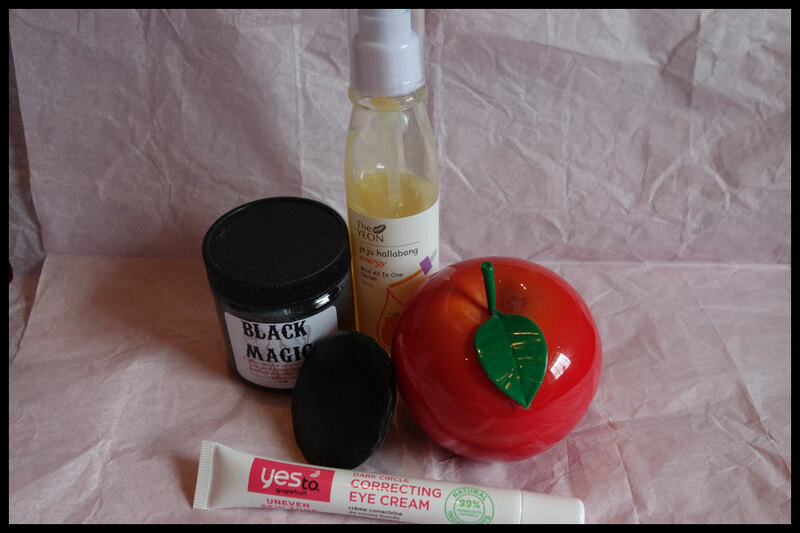 I found this Yes to… Grapefruit Dark Circle Correcting Eye Cream which I use twice a day and I do like it. It’s a bit of an odd colour as it looks like it should tint your under eye but it goes on clear. This does seem to help with dark circles but I’m not sure if it works as well as the other sample I had. 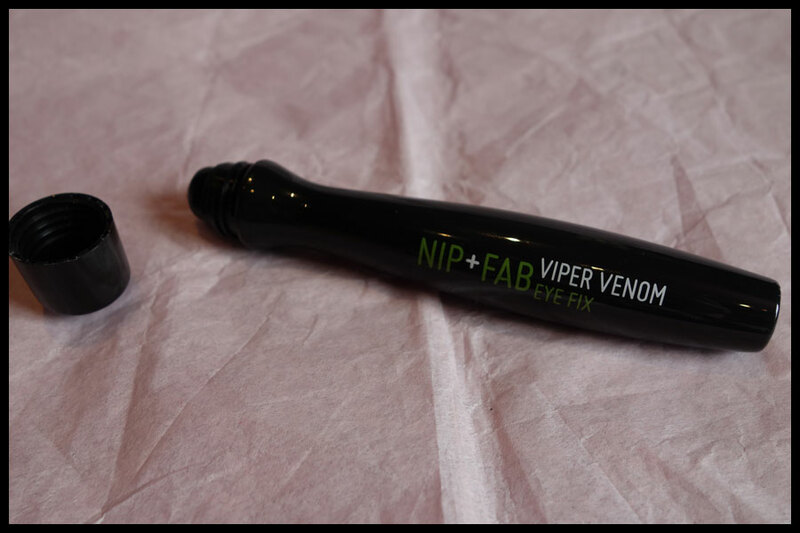 The one product I use regularly throughout the day is the Nip + Fab Viper Venom Eye Fix, this is the one I got in the Tesco advent calendar. I really like how it’s a gel roll on and works so well as something to wake me up a bit. I’m not sure if it’s done anything else but keeping my under eye hydrated and waking me up is good enough for me. At night I’m less careful about washing my face, I often just wash with water but if I’ve used sun cream or worn makeup then I will use one of the two products in the photo. 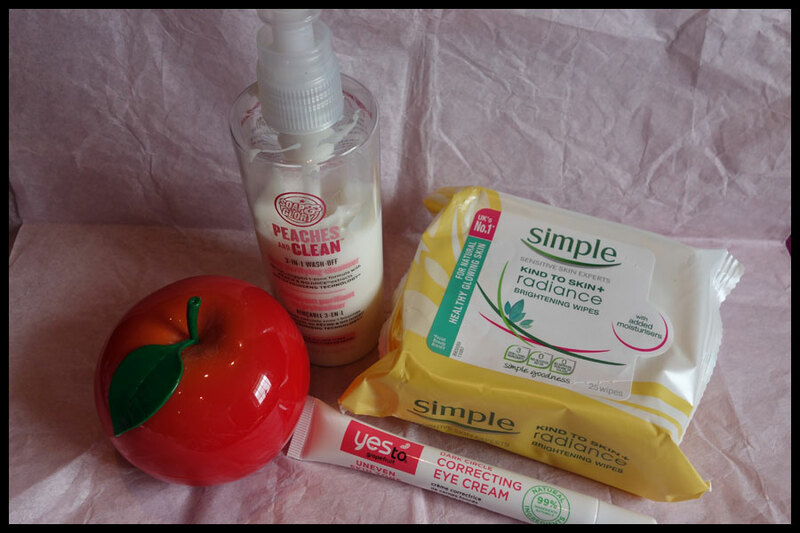 The product I use more often is probably the Simple Kind to Skin Radiance Brightening Wipes, they’re just so quick and easy to use and are on offer pretty often in Boots. I prefer these to the normal ones, though I do have some that are meant to exfoliate as well, these just seem to suit my skin more and don’t dry it out so much. I use my Peaches and Clean from Soap and Glory if I have more time and feel like something more luxurious, which probably sounds a bit of an odd thing to say but it’s definitely creamier than the face wipes. It’s a cleanser and makeup remover so I use cotton wool pads to apply it then wash it off with my flannel and warm water once I’ve either covered my face or removed all the makeup. The final step is the moisturiser and I tend to use the Tony Moly Appletox moisturiser here as well. I did have a Vitmain E Night Cream from the Body Shop but as I’ve got enough others I decided to just have this one as it works well enough for me. I also loved the Soap and Glory Night in Shining Armour night cream but that had a bit more of a face cream smell than either of the others which I’m less keen on. 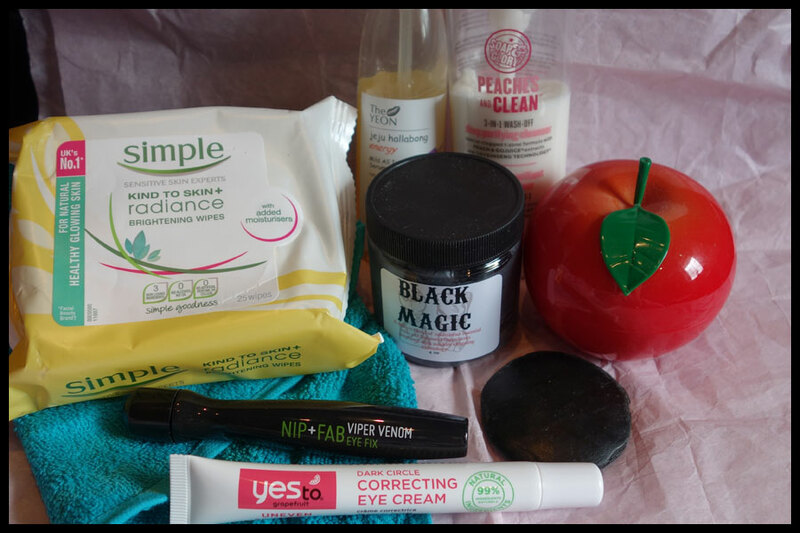 I hope you enjoyed this post, I always find skincare routines interesting as everyone has different skin and there are so many products out there it’s fun to read about new ones and combinations I haven’t tried. Have any of you tried these products? How did you get on with them? And does anyone know where the Yeon sell their products that could ship to the UK? I had a look on their website earlier today when I was taking the photos and I may have a bit of a shopping list for if they ever sell over here, there are so many products I want to try.